Last week, NASA announced that after nine years of service, the Kepler Space Telescope has run out of fuel and will be switched off. It’s in an orbit around the sun, far from Earth. To date, it has been credited with the discovery of some 2,681 planets outside our solar system from both the Kepler and K2 missions. The K2 mission was the follow-up that happened after two of Kepler’s reaction wheels failed and it could no longer point at its target field. There are 2,780 candidate planets still to be checked with ground based observations, so Kepler’s total discovery count will likely increase even now that Kepler is off line. Among the planets Kepler has discovered include numerous Jupiter-sized worlds orbiting their stars in mere hours, many ice giant worlds like Uranus and Neptune, and there are some 361 candidate and confirmed planets in the habitable zones of their stars. Earlier this year, Kepler’s successor, the Transiting Exoplanet Survey Satellite, or TESS, was launched. Whereas Kepler was designed to monitor one part of the sky and see how many planets it could find, TESS is designed to survey the stars nearest to the Earth. TESS has already its announced its first exoplanet discoveries. Steve Howell observing at the Mayall 4-meter telescope, confirming Kepler discoveries. 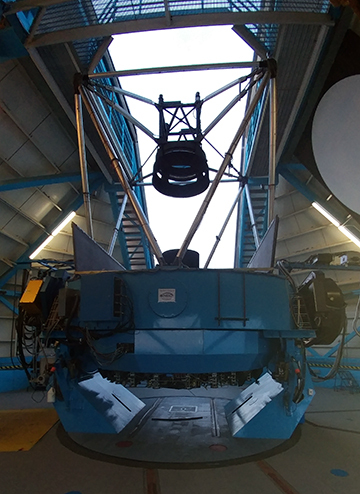 At Kitt Peak, I work at the Mayall and WIYN telescopes, which are involved in confirming exoplanets. WIYN’s telescope scientist was Dr. Steve Howell when I started working at Kitt Peak eleven years ago. Steve since moved on to become Kepler’s Project Scientist and now serves as the head of the astronomy and astrobiology section at Ames Spaceflight Center which serves as the center of Kepler and TESS operations. One night while observing Kepler targets we began to talk about how Mars became more of a place in people’s imaginations after it started appearing in the science fiction of H.G. Wells and Edgar Rice Burroughs, so we hatched plans to compile an anthology of stories set on Kepler worlds. 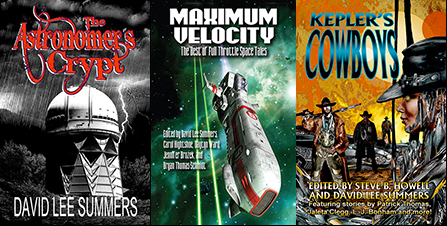 Our first anthology was A Kepler’s Dozen, which collected action-packed, mysterious, and humorous stories all based on real planets discovered by the NASA Kepler mission. 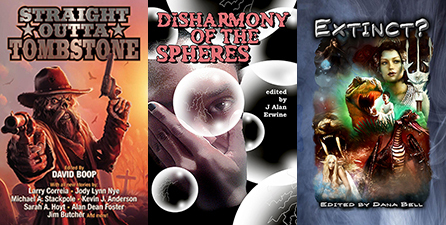 Authors like Mike Brotherton, Laura Givens, and J Alan Erwine imagined stories set in places like a prison colony, or escaping from the authorities, or encircling a binary star. We collected thirteen stories in all. We also included facts about each of the planets written about in the anthology. You can learn more about the anthology at: http://hadrosaur.com/kepler.html. 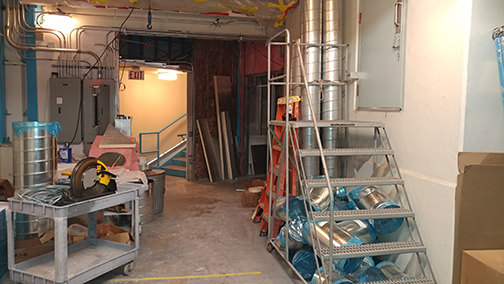 Also at the page is a link to a press release by the National Optical Astronomy Observatory that gives more background about the Kepler telescope and Kitt Peak’s role in confirming discoveries. Kepler has had a great run and it’s sad to see it reach the end of it’s life. 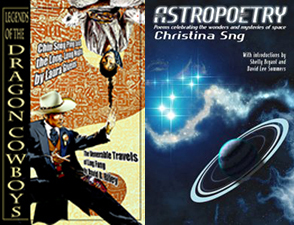 Still, I think we could fill many more anthologies with stories about its planets and that’s even before we do any anthologies featuring discoveries by TESS. While you’re waiting, you can check out my space pirate story collection Firebrandt’s Legacy, which not only visits a couple of Kepler planets, but several other possible worlds out in the galaxy. You can learn more about that project at my Patreon page: http://www.patreon.com/davidleesummers. On Friday, I had a great time giving a reading at Potions Lounge, a speakeasy bar on Bourbon Street in New Orleans managed by Marita Crandle, owner of Boutique du Vampyre. I love reading from my work and, in recent years, I almost always sell books as a result of my readings. Unfortunately, readings are not always well attended, especially at venues such as science fiction conventions. The reason is simply that many readings don’t prove to be memorable experiences and people skip them for other events. Below I present a few tips that have worked for me when giving readings. This may sound counterintuitive, but allow me to explain. Often at a reading, the first thing I see someone do is pull out a copy of their novel and start reading from it. It seems like a good idea because you’re reading the words as they were published and you’re showing off your book. The problem is that font sizes and bindings often mean you have to hold the book closer to your face than ideal. It also can be surprisingly easy to lose your place, especially if you look up to make eye contact with the audience. I took a lesson from my days in choir. I print out my reading with a nice, easy to read font on one side of the paper and put it in a notebook. It allows me to hold the book further away, making it easier to look up from time to time and make eye contact. If you want to show off your cover on what you’re reading from, you can print out a nice copy and slip it into the plastic sleeve on the front of the binder. Better yet, bring your book and prop it up on a table while you read. When I’m nervous, I start talking faster. When I talk faster, I stumble over my words and my words become non-distinct. My mom’s family is originally from Texas and when I catch myself doing this during a reading, I summon my inner Texan and slow down. By this, I don’t mean that I drawl my words, but I take my time with each word and make sure I see and say each one in turn. It’s actually quite hard to go too slow during a reading. I spend months and perhaps even years with a manuscript before it’s published. Therefore I must know it inside and out. Right? Maybe, but that doesn’t mean I can read it well. Again, taking a lesson from those choir days, it doesn’t matter how well you think you know a story, practicing always helps. 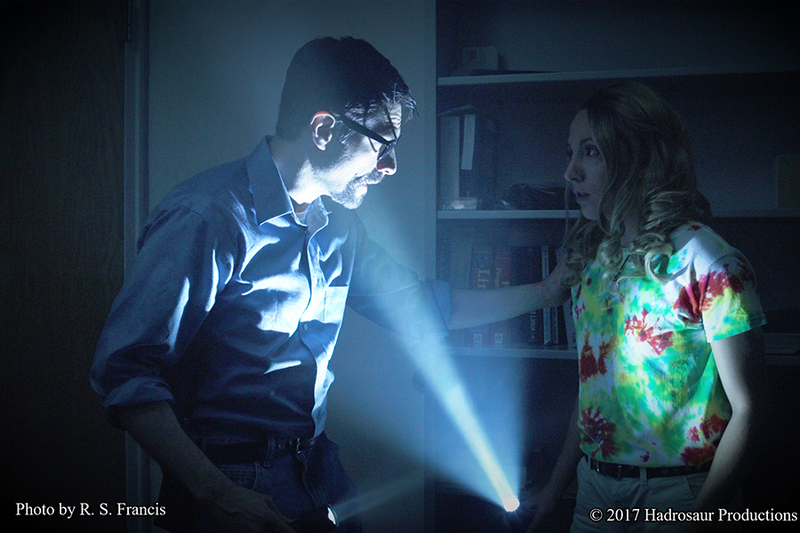 A rehearsal session also allows you time to experiment with varying your voice for different characters. If it works, great. If it doesn’t, just work on making sure you learn to read their dialogue as naturally as possible. Some readings enforce time limits, especially if you’re reading during the same session as others. Practice helps assure that your reading will fit. Make sure you practice going slow! I don’t necessarily mean that you should read a novel from cover to cover or even a complete chapter if your chapters are long. However, your reading should have a hook, some development, and some kind of satisfying conclusion. Let your audience feel as though they’ve had a complete storytelling experience. This is a term from Southern Louisiana and it means “a little something extra.” Always give your audience some kind of lagniappe. A baker might give you a thirteenth doughnut when you order a dozen. When I give a reading, I try to do something a little extra and fun. 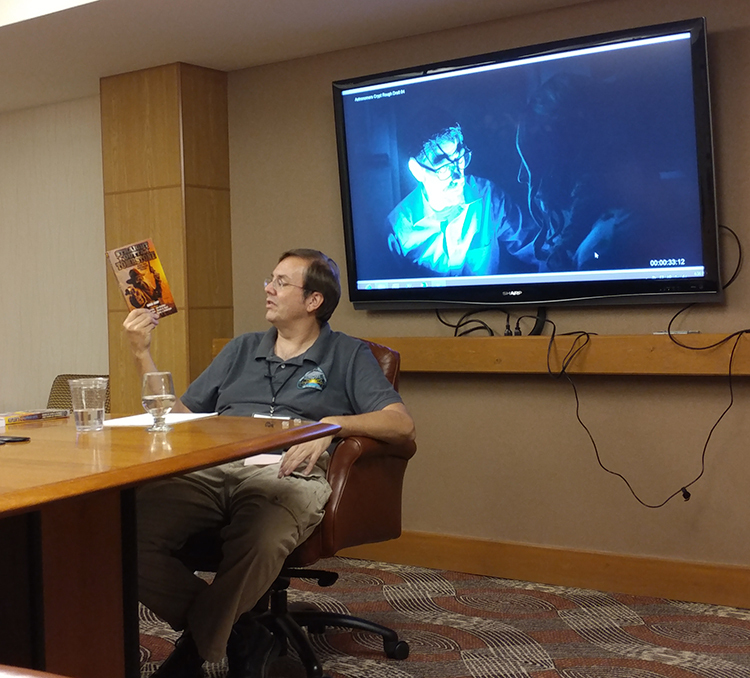 The photo above is from WesterCon in Phoenix where I showed a rough cut of the book trailer for The Astronomer’s Crypt during my reading. 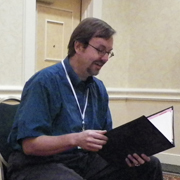 At Bubonicon, later that year, I read from my new anthology Kepler’s Cowboys and invited fellow contributor Gene Mederos to read with me. He showed off some of the artwork he’d created inspired by the stories. I’ve done Halloween readings where I give out candy. I even did a space pirate reading where we sung sea chanties. A lagniappe doesn’t have to be big. It doesn’t even have to cost you anything. What it should do is let the audience know they’re special and appreciated. Are you an author who has given readings? If you have additional tips, please feel free to share them in the comments below. This past week, my daughter and I watched live as the Transiting Exoplanet Survey Satellite, or TESS, was launched into orbit. This satellite is the follow-up to NASA’s Kepler Space Telescope, which was designed to point to a specific region of space known to have many sun-like stars and get a sense for how many of them have exoplanets. As it turns out, the answer is many! The only problem is that Kepler’s region of interest didn’t include many nearby stars. TESS’s mission is to look at stars close to Earth and see which ones harbor planets. Here’s the video of the launch for those who missed it. 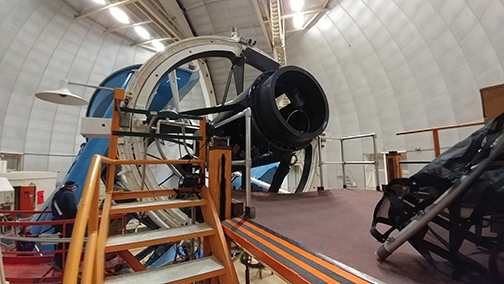 As I mentioned a couple of weeks ago, the NEID Spectrograph on the WIYN Telescope at Kitt Peak National Observatory where I work will be supporting and following up on TESS observations. This launch is a major milestone in the overall search for exoplanets. I gather it will take about two months for TESS to reach its final orbit. During that time, cameras and instruments will be tested to make sure everything made it through launch with no problems. The most amazing part of the launch for me was to see how fast TESS made it into orbit, really only a couple of minutes after launch itself. And yet, with current technology, even the nearest exoplanets are still out of feasible travel range for humans. Despite that, I still have hopes that we’ll find destinations that we, as a species, will feel driven to explore. Once we do, I hope we’ll find ways to make the trip happen. In fact, one of the technologies that might allow a voyage to nearby solar systems is scheduled for testing later this year. The Planetary Society’s LightSail 2 is scheduled to launch on a SpaceX Falcon Heavy this summer. I imagine what a voyage through the solar system might be like using such a craft in my novel The Solar Sea. Of course this is part of the reason that Steve Howell from NASA and I felt compelled to compile the anthologies A Kepler’s Dozen and Kepler’s Cowboys. They allow us to envision what the worlds we’ve been discovering might be like. They allow us to imagine life in new ways, and even to imagine exciting possibilities for things we could find on worlds that don’t harbor life as we know it. Of course, reality is such that what we discover will no doubt go far beyond what we imagine! So, once the TESS and NEID teams start finding worlds near the Earth that we can imagine, will Steve Howell and I put together another anthology? I suspect there’s a good chance we will. Whether or not we do, I encourage writers to keep an eye on the discoveries because there will be plenty of inspiration for some cool science fiction stories in the coming years.